On 18 MAY 1778, a Removal Order was served on my 5th Great Grandfather THOMAS BLANDON, DRUMMER in the Western Battalion Militia of Suffolk. Thomas, Mary, his wife, and their children Mary, Elizabeth, Ann, Thomas & Susannah were ordered removed from St. James, Bury St. Edmunds and sent to Wenhaston. Source: Removal Order FC189/G4/14. Suffolk, Ipswich Branch, WENHASTON PARISH RECORDS Date: 1778. I wasn't sure why a Removal Order would be issued and what the circumstances were surrounding one. 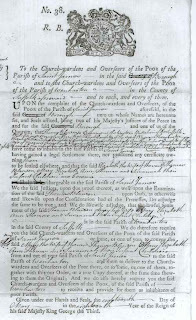 So I did some research and found out that inn 1662 England an Act of Settlement was passed to define which parish had responsibility for a poor person. A child's birthplace was its place of settlement, unless its mother had a settlement certificate from somewhere else stating that the unborn child was included on the certificate. From the age of 7 the child could have been apprenticed and gained a settlement for himself or he could have obtained settlement for himself by service by the time he was 16. Apparently a Settlement Certificate would have far more genealogical information but I wanted to see that Removal Order so I sent off for a copy. The documents I ordered just arrived this week (pretty quick service!) and I'm pleased that the Removal Order gave the ages of each of Thomas & Mary's children. I also ordered two Bastardy orders and one Bastardy Examination for my ancestors, and will talk about those and the genealogical information in them in another post. The Removal Order is a form document with blanks to fill in, which indicates to me that there must have been a lot of them served! What a wonderful item to find. If you have English ancestors, why not have a look online? You might be surprised at what is there.